On June 5, our synod undertook a massive food packing event to help feed the hungry in our local communities. Our goal was 300,000 meals...and the grand total was 300,324! Many thanks to the 1,000 volunteers who used their hands to do God's work, and to the many congregations and individuals who contributed funds to the effort. Also, thanks to Messiah College for its donation of facility and human resources and Thrivent Financial for their partnership. 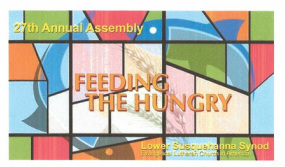 651 voting members, visitors, and official guests of our synod gathered June 6-7 at Messiah College around the theme "Feeding the Hungry". Youth and young adults were a significant part of the assembly serving as voting members, pages, assembly planners, worship leaders, and display personnel in the Connections Cafe. Assembly business can be viewed at www.lss-elca.org/assembly. Below are the preliminary minutes from this year's assembly.